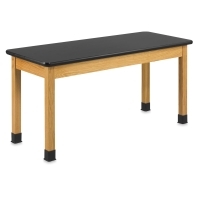 Ideal for studios, classrooms, and other creative spaces, the Plain Apron Table from Diversified Woodcrafts is solid, sturdy, reliable, and durable, not to mention handsome. The apron and legs are crafted of solid red oak joined with heavy-duty steel hardware. They wood is smoothly machined and preserved with a chemical-resistant, UV-resistant, earth-friendly finish. Rubber leg boots protect the finish from floor cleaning products — no need to move the table when mopping around it. Non-skid adjustable glides allow for precise leveling on uneven floors. Choose from six sizes and four tabletop surface options to suit your needs and budget. 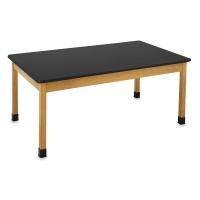 Plastic Laminate Top — High-pressure black plastic laminate offers an excellent work surface that wears exceptionally well under normal use. The laminate is bonded to a 45 lb density, industrial-grade particle board core, and the edges are finished with T-molding for extra durability. 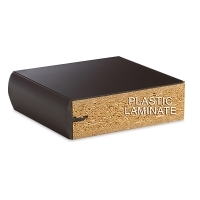 Plastic laminate has superior resistance to scratching but limited resistance to high temperatures and severe chemicals. This surface is 1¼" thick overall. 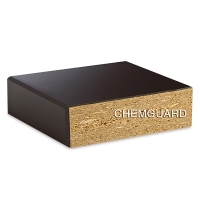 ChemGuard Top — ChemGuard is a form of treated laminate that has been tested and proven to offer outstanding chemical resistance, plus significantly greater durability than standard laminates. This surface's edges are protected with 3 mm PVC molding. It measures 1¼" thick overall, and has a black finish. 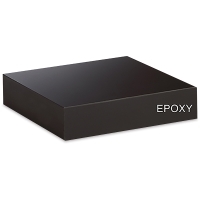 Epoxy Resin Top — Solid black epoxy resin is extremely durable and completely impervious to chemicals, heat, and moisture. This best-quality surface measures 1" thick overall. Black Phenolic Top — The phenolic top is ideal for settings where harsh chemicals are used. It's extremely chemical resistant and takes heat up to 300°. It's ¾" thick. ™ Diversified Woodcrafts is a trademark.™ ChemGuard is a trademark.